Here's a work in progress where I stitched "magic flowers" and partial blossoms along a vine of assorted seed beads. The background is made with wavy lines of turquoise true cuts (size 11-0). 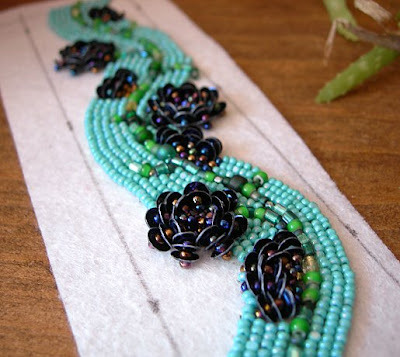 Because bracelets tend to be subjected to everyday abuse, wear and tear, I'll reinforce the sequins again with a separate thread, before I mount the beadwork onto the metal. I love the flowers that you have created with the sequins. If I ever saw that technique before, it must not have impressed me as much as your design. Very pretty! I absolutely love this cuff! The sequin flowers are amazing. Gold is the New Silver? New Studio: Let There Be Pink! Oh Where Oh Where Has My Widdle Blog Gone? How much epoxy resin clay do you need?